All across the country, eye surgeons are promising patients that they will restore their ability to see which will dramatically improve their confidence and revitalize their spirit. They promise that they can "stop" and "fix" diseases and refractive disorders and that with their surgeries- will restore their patient's ability to see 20/20. While no eye surgeon can guarantee any particular result, many are claiming high expectations despite the fact they are well aware that such claims will leave many patients dissatisfied since many will leave their offices without these superb results. Furthermore, many eye surgeons are also aware that their limited one or two surgeries will only help patients who fit that particular criterion. While you do not see these limitations in any one of their ads, it is the unfortunate truth that once their patients have had surgery, time only tells how little some of these patients have actually gained. Patients with cataract find that their vision is left on the table while others with scars are told to learn to live with them. Some are offered radical and unnecessary corneal transplants while others are left with only a bill for a visit that provided no hope. There are many eye surgeons across the nation who are skilled at what they do. 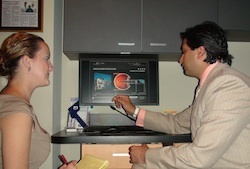 There are also just as many eye surgeons who do keep their patients and their concerns close to heart. However, there are just as many surgeons who are labeling their patients by numbers with a goal to shuffle through them as fast as possible. The number of surgeries that are conducted daily while surpassing the true well-being of patients occurs on a daily basis. If a patient walks in with a slight complication requiring additional attention and time, many eye surgeons will asses the potential gain from that patient and if the financial gain is high enough, will only then accept their case. Others who simply have a more complex case requiring a tailored approach find that if they do not fit the standard, they will not receive the much needed advice, attention, and help them so desperately require. The true reason as to why many eye surgeons do not wish to take on a risky surgery is clear- it is the fact that they know that they are very limited by the one or two surgeries that they are comfortable with and that they are simply not capable of providing the results that a particular patient can receive. Furthermore, these surgeons are not qualified at such a high level, which only results in their decreased confidence. What is the patient left with? I can tell you that they are left with everything but the one thing that they need the most- hope. "You do not fit the standard and therefore you are not a candidate." This is the excuse that many eye surgeons feed to their patients daily. While this is not in their brochures, it is the unfortunate truth that patients are turned away everyday without any clear direction as to how they should move forward. However, one eye surgeon is dedicating his life in ensuring that all patients have a fighting chance and that by working together, great results can be achieved. Dr. Arun C. Gulani, director of the Gulani Vision Institute, located in Jacksonville, Florida is rewriting the standards of patient care one surgery at a time. Sure Dr. Gulani has an exceptional 7-star medical oasis and an impressive website that serves as reference for both patients and other eye surgeons. However, the main source of his success stems from not one or two surgeries that he has perfected, but a range of over 40 surgeries customized for each patient despite how simple or complex their case may be. Furthermore, he educates his patients and confirms to them that they indeed are candidates and that by working together, they will go beyond 20/20. This family approach allows patients to receive one-on-one attention while ensuring that whatever surgery may be needed- the end product is always superb vision. Once you have visited the institute, interacted with his staff, and seen the results of the thousands of patients who have been turned away by other surgeons, you wonder how patients receive this level of care from a world-renowned eye surgeon who owes them nothing more but exceptional treatment options.